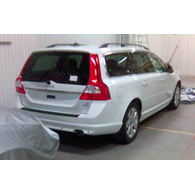 (autoinsidernews) - Photos have leaked out of an undisguised model of what is likely the next-generation Volvo V70. We have seen heavily camouflaged models of the XC 70 variant, but these are the first spy shots that show a completely undisguised model, this time a white V70 T5 AWD. The new V70 borrows many styling cues from the all-new S80, which lends some credibility to the rumors that Volvo may cancel the S60. With a longer wheelbase and shorter rear overhang, it looks like Volvo has traded some cargo space for more legroom for the rear seat passengers, reports Trend. The exciting news is that sources say Volvo plans for the next-generation V70 R include a uprated version of the 4.4L V8 also used in the S80, but tuned to deliver up to 370-hp.